Incoming University of Kansas Chancellor Douglas Girod will earn a higher salary than the outgoing chancellor of eight years, with the potential to earn additional money practicing medicine. Girod, 59, is currently executive vice chancellor of the KU Medical Center and a practicing surgeon specializing in ear, nose, throat, head and neck cancer. His appointment as chancellor begins July 1. Girod’s salary as KU chancellor will be $550,000 plus $31,250 in deferred compensation awarded at the end of the year, according to his agreement with the Kansas Board of Regents. The agreement, signed Wednesday, was requested and obtained by the Journal-World on Thursday. For each year he remains KU chancellor, according to the agreement, Girod will be paid an increasingly higher sum in deferred compensation at the end of the year, up to a maximum $125,000 annually after four years. Private funds from KU Endowment will pay for $175,000 of Girod’s salary — leaving $375,000 coming from state funds, according to the agreement. KU Endowment also will fund the deferred compensation. Aside from raises he may receive, that deferred compensation would bring Girod’s salary up to $675,000 — nearly as much as the base salary he has been earning as executive vice chancellor of the KU Medical Center. In his current position, Girod’s total “university-guaranteed” salary is $808,235, according to KU spokesman Andy Hyland, responding to a request from the Journal-World. Hyland said the university pays Girod $687,000 using state funds and that the remainder is for clinical time paid through University of Kansas Physicians Inc.
At $687,000, Girod is paid the most state funds of any KU employee, Hyland said. Girod’s salary has been raised in the past, but he has declined merit raises for the past two years, Hyland said. Hyland said clinical compensation isn’t typically made public. However, Girod’s current agreement with the university states that he is allowed to earn about 15 percent of his total pay by practicing medicine. 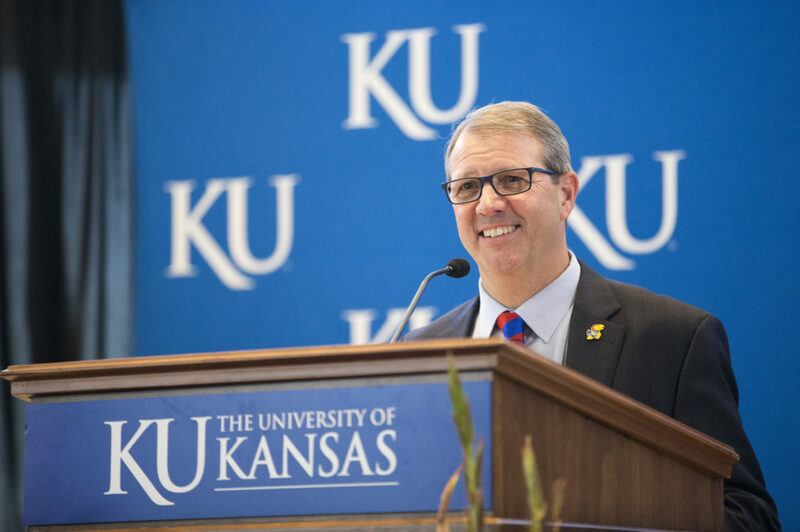 In his new position as KU chancellor, Girod will still have the opportunity to earn money by practicing medicine, although the specific amount he can earn through clinical work is not outlined in the new agreement. “It is understood that you may continue to practice medicine during your tenure as Chancellor if agreed to by the University of Kansas Physicians Incorporated and subject to all Board policies, including those requiring reporting of compensation earned and addressing conflicts of interest and commitment of time,” Girod’s agreement with the Board says. Girod said, in a recent interview with the Journal-World, that he planned to continue seeing some of his long-term patients on a limited basis while serving as chancellor. Oct. 31, 2016 — How does KU’s CEO salary compare with other universities? Bernadette Gray-Little, KU’s chancellor since 2009, earned a salary of $510,041 this year. Roughly half of that is paid with private funds through KU Endowment. The Board of Regents hired and announced Girod as KU’s next chancellor on May 25. The KU chancellor is required to live in the Outlook, the on-campus chancellor’s residence on Lilac Lane. Girod said he plans to move there from his current home in Mission Hills, though he hasn’t yet set a moving date. — Reporter Joanna Hlavacek contributed to this story.